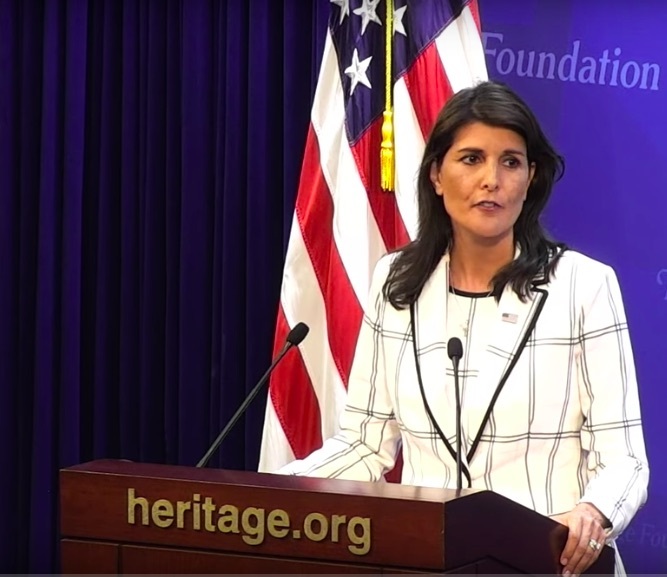 On July 18, the Ambassador to the United Nations Nikki Haley gave the keynote address at the Heritage Foundation, a conservative American think tank, on the US withdrawal from the UN Human Rights Council. The full speech and subsequent panel discussion can be found here. Ambassador Haley’s speech was directed as much to an American audience, and for that matter, a conservative audience, as an international one. She spoke often of “American values,” criticised the previous administration for failing to reform the Council, and the harshness of her condemnation of the Council is in line with the expectations of the President’s base. Nonetheless, Ambassador Haley did not fully disassociate the US from the Council in her speech. She began by pointing out that the US was in fact instrumental in creating the predecessor to the Council, the United Nations Commission on Human Rights. She said that this institution was intended to be, as Eleanor Roosevelt put it, a ‘place of conscience.’ She ended her speech leaving open the possibility of a US return to the Council, provided that US reforms are supported and the Council becomes, as she puts it, a place of conscience rather than politics. Her main issues with the Council? Ambassador Haley’s main complaints with the Council do not differ substantially from the areas of reform she highlighted in her remarks at the Graduate Institute in Geneva a little over a year ago; that it counts the worst human rights violators among its members, and that it is inconsistent and unbalanced in which States it critiques, particularly with regard to the Council’s Agenda Item 7, which she contends unfairly singles out Israel. In her address on the 18th Ambassador Haley added to her list of grievances the failure of member States and stakeholders to support her efforts at reform. She asserted that at the Council authoritarian regimes obtain membership to protect themselves and their allies, and thus use their positions to maintain the status quo. She condemned NGOs, calling out specifically Amnesty International and Human Rights Watch, who she claimed agreed with her ideas behind closed doors but failed to support her proposals publicly, and who claimed that opening the Council to change would leave it vulnerable to alterations that could make it worse. She added that even countries who supported human rights would agree with the US off the record but then refuse to support reforms publicly, though she did not name names. With the US unable to push forward the reforms that Ambassador Haley claimed were critical to the credibility of the Council, she said that the US felt that they had to leave. Ambassador Haley assured the audience that the US would continue to support human rights at the UN and internationally, indicating multiple times in her speech that the US would continue to champion human rights issues on a global scale. She spoke in broad terms about US convictions on human rights, making no reference to whether or not the US would cooperate with Council mechanisms, such as the Universal Periodic Review, Special Procedures, or Treaty Bodies, nor did she discuss the funding implications of this decision. Ambassador Haley said that the US will ensure that human rights violations will be addressed at the Security Council in New York, and that the US will continue to work on prevention objectives. She noted the connection between mass atrocities and human rights violations, affirming that: ‘when we work to protect human rights we can prevent conflict.’ Interestingly, the 38th Session of the Council featured the tabling of a resolution by Colombia, Norway, Sierra Leone and Switzerland on ‘the contribution of the Human Rights Council to the prevention of human rights violations.’ The resolution aims to begin an inclusive conversation at the UN about how the Council can better fulfill its prevention mandate, in its own regard and combined with the other two UN pillars.